Although this unfortunately cannot be said for many websites that still look like they were designed using a 90s-era template, User Interface and Design has become one of the hottest trends in website design. Developers are being challenged to throw out the traditional formats and approaches to navigating sites and find a more intuitive way to both organize information and serve it up to the user. Applications and mobile operating systems have played a role in this shift as well, by exposing users to new and different ways of finding and interacting with information. This same principle is slowly showing up at brick and mortar retail stores. 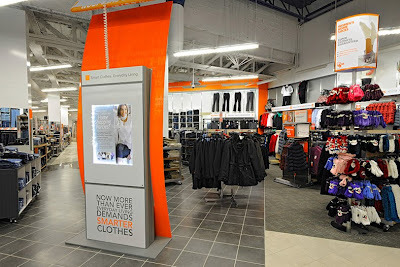 Rather than following traditional store templates that organize products into long rows of shelving and aisles, forcing shoppers to navigate past aisle after aisle in order to find what they're looking for (as many websites force us to do), some retailers are incorporating User Interface and Design into how their stores are laid out and organized. 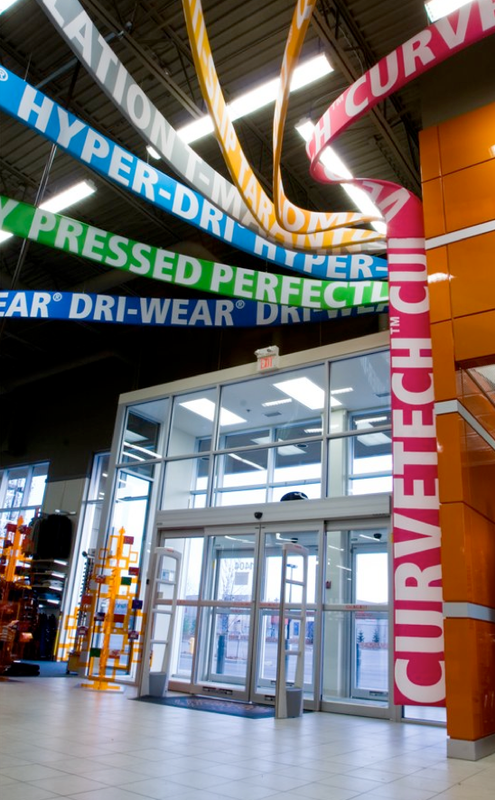 As Atchison's article points out, the Mark's Work Wearhouse prototype outlet in Edmonton is a great example of implementing web-based design principles at retail. Although not too different than what the retailer normally looks and feels like, the store incorporates eye-popping overhead banners to direct people to grouped product families and LED touchscreens to provide additional information on specific products, not unlike an e-commerce site. 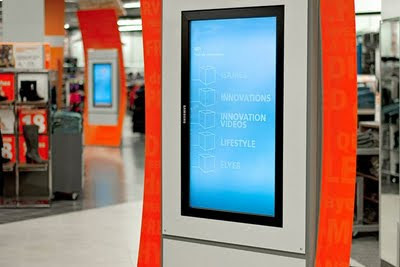 Another way in which the web has changed what we expect from the in-store experience is the need for interactivity. E-commerce sites have allowed online shoppers to interact with and explore products in a much more "tactile" way (as tactile as an on-screen experience can be...). 360-degree views, product benefit demonstrations, video reviews and more allow shoppers to test out just about every aspect of a product before committing to buying it online. And so, retailers are responding by increasing the interactivity of the shopping experience in-store and finding new ways to allow their shoppers to experiment with their products. The Mark's Work Wearhouse prototype store is once again a great example of increased product interactivity. 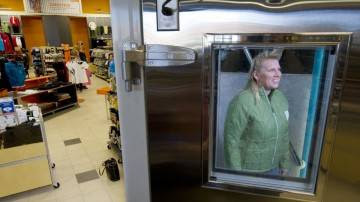 The store features a walk-in freezer that allows shoppers to test out cold weather wear in temperatures of up to -40 degrees celsius, as well as a custom ramp with different surfaces (like stainless steel and rocks) that lets people test out the "Anti Slip" technology featured in some of the store's footwear. The web has enabled people to become the ultimate online shoppers: with just a few clicks, you can quickly compare product specifications, view consumer reviews, and even design customized, made-to-order products from the comfort of your own home. You can quickly and easily browse through swaths of SKUs, saving the ones that capture your interest and adding them to a virtual cart so that you can check them out when ready. Another element that has become a key aspect of online shopping is the recommendation engine: by analyzing your past pattern of purchases, e-commerce sites like Amazon serve up suggestions for products that the engine thinks you might also like. Social recommendations have also become more of a factor - finding out how many people have "Liked" a product, or how many of your Facebook friends have bought or would recommend a product will soon have a greater influence on online shopping behaviour. And so, the same elements are slowly working their way into the in-store shopping environment as well, with some retailers attempting to use emerging technology to replicate the experience of shopping online. 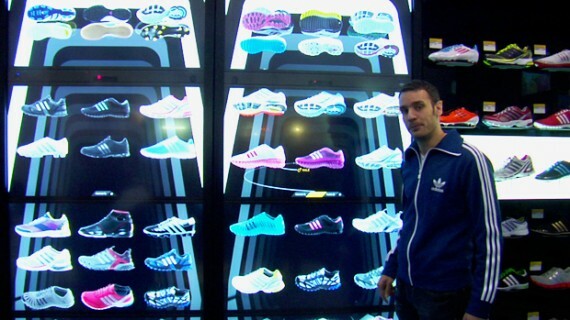 The Adidas "adiVerse" Virtual Footwear wall is a great example of this. 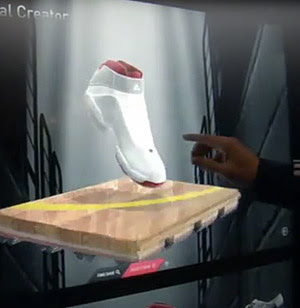 The impressive touch screen interface allows shoppers to compare and contrast the brand's line of over 8,000 pairs of shoes in the form of 3D renderings. Facial recognition software will determine your gender and serve up relevant products. You can find out what others are saying about specific lines of shoes on Twitter. Finally, you can add the shoes that you like to a virtual cart - just like you can online - and check them out with a store associate armed with an iPad. Very cool! As we've seen, the web has influenced the way in which retail stores are designed and organized, the way in which shoppers interact with and test out various products, and the way in which shoppers compare, contrast, and purchase items. But what about the influence of retail on the web, and the offline-online integration that comes with it? What if in-store experiences could easily be relayed and shared with one's social network to tap into opinions and show off purchases? 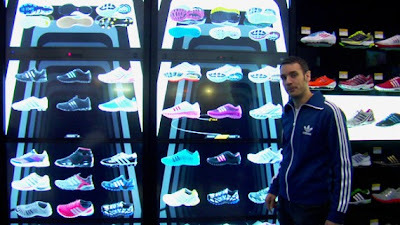 As John Williams of the retail consultancy J.C Williams Group puts it: "Integration of online and in-store is essential. That's the new retail model. 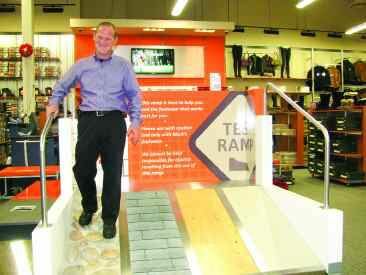 Those retailers that aren't on it or aren't moving toward it are missing a beat."